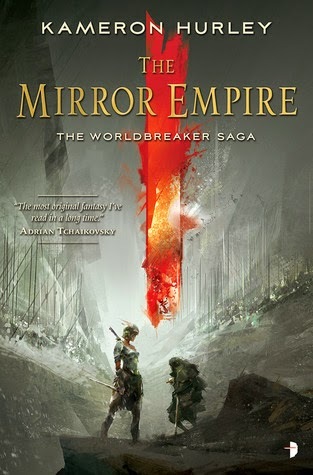 If you read other SFF blogs or follow bloggers on twitter, you might have heard something about Kameron Hurley's latest, THE MIRROR EMPIRE. Pretty much everyone I follow has been gushing about this book for months. Now you can read it too. Writing this review was a bit of a challenge, mostly because I really enjoyed throwing myself into this world with no knowledge other than what was in the blurb and a few "You have to read this" tweets. Trust me, this was completely done on purpose. Yes, I realize the irony that a book reviewer is stating that she refused to read any other reviews before reading this book. Some books are like that. So what to do with this review? I think I'll do it in three stages. First, if you think that this is a book that you'd like to read, and like me, you enjoy immersing yourself into a story, I will echo my tweeple and say Yes, go read this book. It was fantastic and I want more yesterday. Need a little bit more? With a phenomenal universe (world is not quite enough here, as the setting encompasses so much and so many possibilities), complex societies, interesting, diverse, multi-dimensional characters, action, fast-pace, this book draws you in, lets you peel back layers while exposing more secrets, and makes you want more. Set in a world where the stars control magic and a dangerous, powerful star is on the rise for the first time in thousands of years, we follow a few different characters as they come to terms with a rising threat to their world. They all have their motivations and skills, some appear to be the villains, but nothing is strictly good or evil. It all depends on your point of view. The best villain believes that they are doing the right thing, wouldn't you agree? Things come together and the setup for the next book was pretty damn good. I'm counting down the days. Finally, you know I really don't do long-out, spoilerific reviews, but I will discuss a few more points after the break. I haven't touched on what is likely the 300-pound elephant in the room for most reviews (which, I admit, I haven't read, but I have read enough reviews of SFF that I can reasonably postulate): gender. I have insane hopes that the troll reviews have not come out in force over this book, but so many recent events have lessened my faith in humanity. The world of THE MIRROR EMPIRE encompasses many different societies, but what sets them apart is that in the majority that we see, the women play a predominate part. For example, in Dorinah, the women control everything, men are property, and the women are warriors. In Dhai, traditionally women have been the leaders, family units tend to be polyamorous, but men have more of an equal footing. This isn't an "Oh look, we've gender-swapped all the warriors and made them chicks" book. Women are warriors, teachers, healers, servants, heroes, villains. What stood out here was that the female characters were not just one type, nor were they window dressing. And there were so many of them, complex and fully realized players in the story. The male characters run the gamut as well, from Saiduan warriors to Dhai magic practitioners and leaders, to Dorinah men, like Zezeli's husband, who as a passive piece of property his role is alien to how we would generally see male characters. I'm curious where he is going next. Gender designation was also a part of this world, with feminine aggressive/passive, masculine aggressive/passive, and neither or both being fully accepted and integrated into the cultures of this world. Of course, even within this more open definition of gender, we have a character who falls outside of the socially accepted roles and feels a disconnect from their community. The more open, but still entrenched gender definitions, are not enough. I'm looking forward to where Hurley takes this in the next book. THE MIRROR EMPIRE is a sprawling fantasy with battles on many fronts, where today's ally could be tomorrow's enemy. I just need to read book 2 to find out. And "next book" is really where I'm at here. This is book 1, a set-the-stage book. We have a scattered cast of characters: Lilia, who starts the story as a young child being cast away from home and severely crippled during the experience, Roh her friend who is dancing carefully between his old life and a new one, Zezili, a warrior with an uncertain future, Ahkio, a new leader forced into a fight to save his world, Taigan a force to be reckoned with, a leashed weapon, and many more. What will they do now? Note: If you act fast and get the book from B&N, you might be able to get the second book free (250 copies are available). Details here. Note 2: Absolutely, this is not the first book to explore gender, matriarchal societies, gender identity, but it is a new release that comes to us in a time where a good percentage of the SFF community is calling for more diversity.